Amid Criticism, Netanyahu Seeks Bipartisan Support for Israel in the U.S.
(Bloomberg) -- Prime Minister Benjamin Netanyahu said he hopes support for his country will remain a bipartisan issue in the U.S., amid rising criticism of Israel among some Democrats. Netanyahu was slated to address the group in person but cut short a trip to the U.S. amid violence with Gaza. A rocket from Gaza was fired into central Israel on Monday morning, prompting Israeli airstrikes and additional rocket fire that lasted until early Tuesday. “We will do what is necessary to defend our people and defend our state,” Netanyahu said. He met with defense officials immediately after landing to be briefed on the situation in Gaza. Netanyahu thanked President Donald Trump for formally recognizing Israeli sovereignty over the Golan Heights and said Israel would never give up the strategic plateau, which it captured from Syria in the 1967 Middle East war. 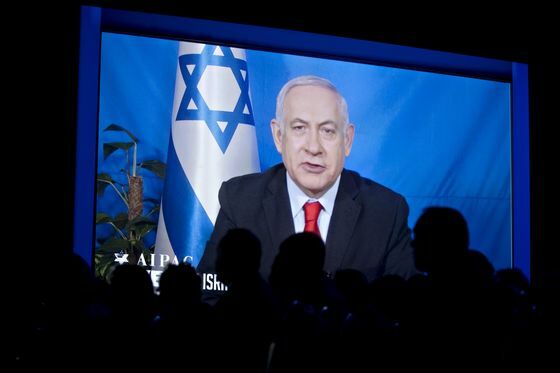 Facing a tough electoral challenge and a corruption investigation at home, Netanyahu pushed back against the suggestion that support for Israel is motivated by lobbying money, as new Representative Ilhan Omar (D-Minn.) recently suggested. Netanyahu spoke after U.S. Ambassador to Israel David Friedman, who said the Trump administration wouldn’t heed critics who dismiss the chances of an Israeli-Palestinian peace agreement. The administration is expected to present its peace plan sometime after Israel’s April 9 election, with Friedman hinting it would be more sympathetic to Israel’s positions than past proposals. “Can we leave this to an administration that may not understand the need for Israel to maintain overriding security control of Judea and Samaria" -- the biblical name for the West Bank -- and a permanent defense position in the Jordan Valley?" he asked. Israel insists it must keep the valley, which borders Jordan to the east, for its security.